I know a lot of people who grew up in the Memphis area spent a lot of time at the various lakes that are near by. However, the first time I've ever been out on a lake in a boat was 2 summers ago when I went to Greers Ferry with a friend to her dad's lake house. We had a really great time just riding around out the boat. I even tried to water ski (and failed miserably). So when Chris's parents said they were looking at getting a lake house we were excited for the opportunity to spend time with his family hanging out at the lake house and making lots of memories of the cousins playing together while the adults play cards and taking the kids out on the lake to go tubing. It'll be a great place to gather for weekends and holidays. But for right now, it's a work in progress. A couple of weeks ago, Grandma and Grandpa Schwartz decided it was time to go ahead and invest in a boat so they could actually enjoy some time out on the lake. So today was Sarah's first time out on a boat in a lake. Cami has actually asked a few times when I want to bring Sarah over to her dad's lake house but I've been pretty nervous about the idea of Sarah on a boat. I didn't know how she'd handle it and I definitely didn't want to get out on the lake for the day only to realize my child hates it and makes everyone miserable. 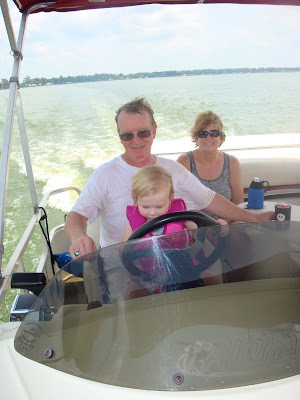 So it was a good sign how excited Sarah was while daddy and grandpa got the boat uncovered and ready. She kept pointing and saying "a boat! a boat! Daddy-boat! Pipaw-boat!" And kept trying to slip away from me to try and get on the boat. I had to take her inside the house and have a chat with her about how she has to hold hands while we're on the dock and wear her jacket when she's on the boat. She just kept shaking her head and saying "Yes! yes!" so I'd hurry up and finish and she could go back out and look at the boat. She loved the boat! She had a huge smile the whole time we were riding around. She really liked standing on the seats and looking at the wake. Then she wanted to look around and peak out from the various doors. She was fearless sticking her head through the gate to peer down at the water. Daddy was loving it. Mommy was a wreck. Anytime she was near me I had a hand firmly grasped on her life jacket. But I think her favorite part was when Grandpa let her help drive the boat. She kept taking Grandpa's hands off the wheel. 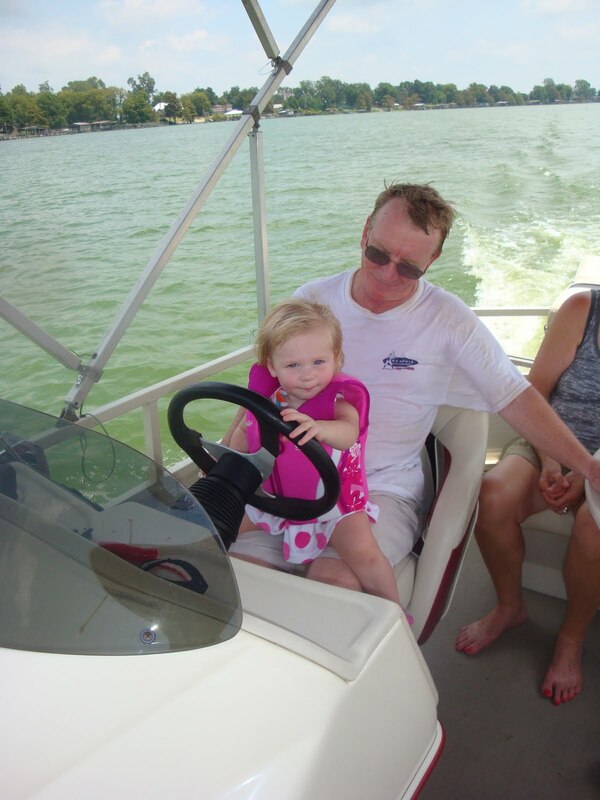 She insisted on driving the boat herself. She thinks she such a big girl. We're definitely entering the little miss independent I can do it myself stage. After weighing anchor and enjoying a nice lunch, Sarah and Chris were dying to get into the water for a swim. Chris did a great job swimming with her and everyone was pretty patient with her constantly wanting to get in and out at our first swimming stop. I think her in and out activity was probably my fault. I stayed on the boat so she kept wanting to get in to be with me and then get back out to swim with daddy and grandma and grandpa. So at the second swimming stop I popped into the lake for a little bit. However, I have water issues so it didn't help Sarah for me to be in the water because I couldn't hold her like she wanted. (I really don't like to swim in water that I can't see to the bottom of so I basically tuck into a ball and try to keep all my parts close so nothing touches me. 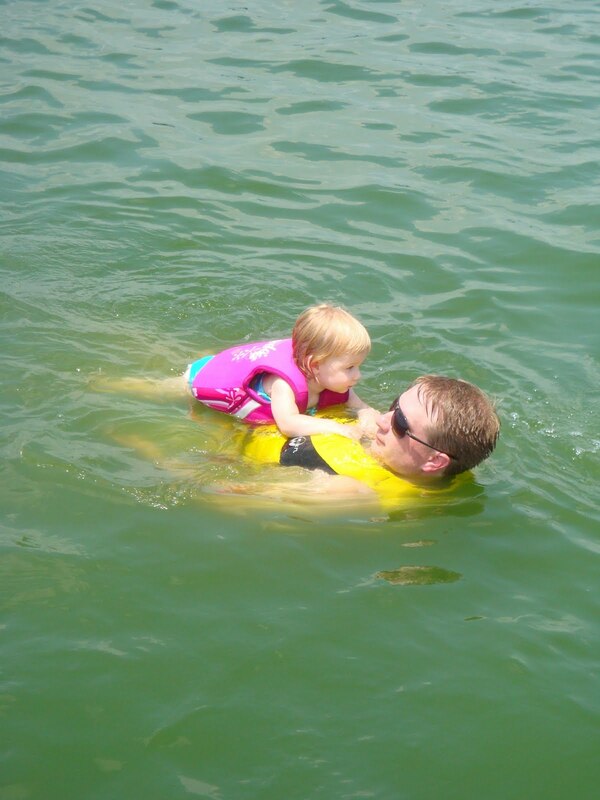 And my life jacket would bob up to my ears if I didn't hold it down so I really couldn't hold Sarah.) So she got back on the boat to run around with grandpa. Sarah really did a good job, but by the end you could tell she was getting tired and cranky so we headed back to the house to get changed and get on the road back home. 3 minutes down the road, Sarah had already passed out in the car seat. So she took a little nap on the ride back to our house and ended up going to bed early since she was still so wiped out. If she sleeps in tomorrow morning the lake may be my new favorite place! Having a great time riding around the lake! Maybe next summer she'll get to go tubing. My parents have a house on horseshoe lake! it'd be SOOO fun to meet y'all out there sometime! your little sarah is a little fish and fearless! btw, i can't seem to comment on your blog. i'm signed in, but it makes me go through a loop to sign in using my google account, and well since i already am, it keeps sending me to the sign in page... frustrating! so, hopefully this anonymous will work-- it's bekah!